The other thing with this country is that it’s very hard to tell who will repay a loan and who will not. Those who have lent to their friends and family can attest to this. There are also fewer ways to make those who have borrowed repay loans. Given bank loans are rare, threatening to blacklist them may not be enough of a threat - it may, however, work for microloans such as mobile loans. Hence why banks require collateral such as land which can easily be sold to recoup loans. So far, we have not answered the question why banks in Kenya charge high rates for loans they issue. Are they malicious? Do they simply hate Kenyans? First things first, we need to determine if rates in Kenya are high. Looking at 2015 lending rates for a a number of countries, we see that Kenya had 16%, Afghanistan 15%, the United States 3.26% and Brazil 43.9%. 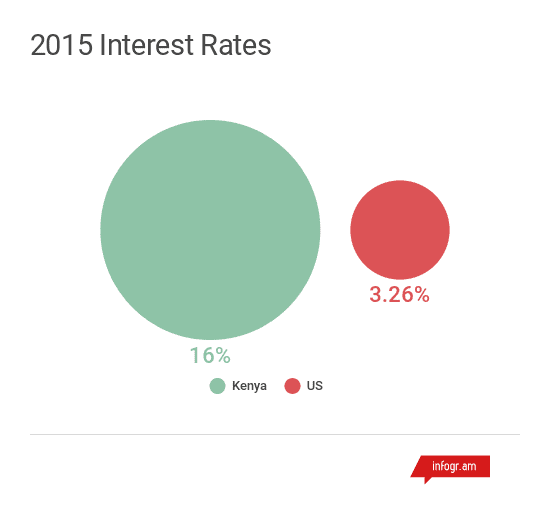 Ignoring the rest, why does Kenya not have as low lending rates as the US? To answer the question, we work backwards by looking at how the top banks in both countries make their money. JP Morgan Chase is one of the largest banks, not only in the US, but in the world. 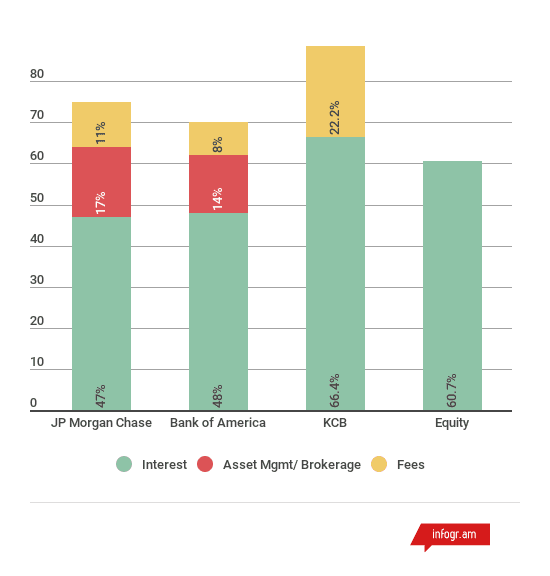 Looking at their 2015 revenue, 47% comes from charging interest, while 17% of their revenue comes from asset management and 11% from principal transactions. Now, let’s look at Kenya’s largest banks. In 2015, before the interest rate caps, 66.4% of KCB’s revenue came from interest income and 22.2% from different fees and commissions. Over at Equity Bank, 60.7% of their 2015 income was from levying interest. This tells us that banks in Kenya are more dependent on interest rates (and banking fees) for almost all of their revenue. To get them to US levels, we would have to drop the interest rate contribution by 20%, not an easy margin. How then, do we get them to cut their interest rates? Looking at US banks, we would have to introduce other sources of incomes for banks, and vastly increase the amount loans being taken. Both, however, are dependent on the size and complexity of Kenya’s economy. To make KSh. 30 billion in revenue from 30 million loans, the average net interest from each loan would be KSh. 1,000. Reduce the number of loans to just 1 million and I have to earn net interest of KSh. 30,000 for each loan to make the same amount of money, hence charge a higher percentage of interest per loan. Therefore, the simplest way to bring down rates would be to increase the amount of loans being processed across the banking industry - to drive competition and hence lower rates. But money to be lend has to come from somewhere - there would need to be a source of large deposits which aren’t been spent on much else, which is not the case in Kenya, though may be the case in wealthy countries. To also increase the amount of loans processed, people have to be borrowing the money to use it in some place where they either expect to make it back, or to spend on so called conspicuous consumption. Credit cards are one such way, where people borrow against future income - credit card rates though tend to be high even in established economies. In the US, these are 12% - 14% which jump to 27% - 30% if you make your payments late. The other alternative is if banks could magically find a way to determine who are most likely to repay their loans and who are not. The field of credit scoring, however, relies on information and recently, on analytical methods. If a business has been existence for 1 year and not 50 years, a computer program may analyse what we know about it to determine the likelihood of that business repaying a loan. An easier model is asking for the person applying for a personal loan to share information about where they went to school, where they live, their Facebook friends, their hobbies, their contact list and more :-). We then analyse the data to profile the person and compare with the profiles of other people we have lend to. Were they good borrowers hence of a lower risk? This may sound strange and scary, but there are no easy pills to swallow for lower interest rates.